Since we use handwriting far less than the age before screens, you may think it is a skill that is less important for our children than it used to be. However, research shows that children who write well easily do better in school and enjoy it more (Dinehart, 2015). Those who have difficulty with the quality and/or speed of their handwriting are often at a disadvantage in the high-paced classroom setting. I invited Lee Dein who created ‘Magic Link Handwriting’, to share her views on why clear and confident handwriting is so important. If this is an issue for your child, I highly recommend her programme. The transformation is amazing! Having been qualified for more than 30 years as a Speech & Language Therapist and dyslexia teacher I remain astonished that the skill of handwriting is neither taught nor even mentioned in speech and language therapy training. Teachers themselves are not, in the main, taught how to teach handwriting as part of their teacher training. As a consequence, illegible handwriting is on the verge of becoming a national disaster. There are many reasons why people have communication difficulties, including physical disabilities and motor coordination problems, which can affect the production of speech. Handwriting is an integral part of communication and this seems overlooked. Studies show children who spend time working on handwriting are more able to produce clear and coherent communication, show better quality of writing and have better thought and organisation skills (Graham, 2009). Speech and language therapy students are well aware of alternative and augmentative communication techniques. These include unaided communication systems. Aided communication methods range from paper and pencil, to communication books or boards, to devices that produce voice 0utput (speech generating devices) and/or written output. In this context, why is handwriting never mentioned? According to the Dyspraxia Foundation, poor handwriting is one of the most common symptoms of dyspraxia. Children who have poor handwriting are usually extremely aware of their difficulty and their untidy handwriting can make them feel uncomfortable and isolated. 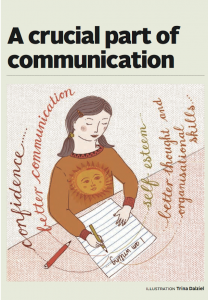 Commonly, children feel depressed and frustrated as a direct result of poor written communication skills. As I have observed frequently, once these skills are taught there is an enormous difference in confidence and self-esteem. Handwriting is a crucial part of communication. Many stroke survivors who have lost the ability to communicate verbally would greatly benefit from communication using pen and paper. The significance of handwriting continues throughout life. It gives us a feeling of identity, possession and intimacy when utilised as part of written communication with others. Good communication in the written modality should be a essential focus. I believe many difficulties arise because handwriting is not taught in a simple and clear manner. There are too many confusing elements involving handwriting and a vast array of complicated fonts. I have developed the Magic Link Handwriting Programme – a unique system because it teaches ‘joined-up’ cursive handwriting. Although schoolteachers and occupational therapists teach the writing of separate letters, the Magic Link programme focuses on a different level of skill, teaching vowels and vowel-consonant combinations in a step-by-step way to develop joined-up handwriting. Designed for primary and secondary schoolchildren, the programme can help pupils who are hypermobile, those with dyspraxia, dyslexia, Asperger’s syndrome or those who are simply left-handed. The video programme is presented in a fun, interactive way. Pupils learn posture, letter and word formation, spacing and coordination , and develop good handwriting habits. Good handwriting is an essential ingredient of good communication- there is simply no justification for overlooking its indispensable place in education and development. I hope this will serve to underline that, with the correct teaching, children’s handwriting can be perfected to a standard of excellence.